"Like all of the best teachers, you opened up a door for us. transformed into an optimistic celebration that I hope will continue for years to come." "You've helped me make a huge step in my journey." "Calley's is the perfect balance of wisdom and spirituality...a perfect blend of healing and teaching." "Beyond yoga ...You've given me a whole new way to look at my health and my life." "I had no idea yoga would be this much fun." "It's like a massage, only you do it yourself!" "I very much enjoyed my yoga experiences. It has made me more flexible and given me a much more positive outlook. I had a stiff neck for days and after my first class I was able to move my neck again. I would highly recommend this yoga for every golfer!" "My back feels so much better now, and I feel so relaxed." 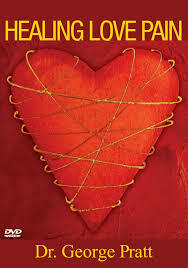 "The wonderful healing yoga you have taught me will serve as a spring board to much more opportunity for me. You have made my escape form drudgery a reality." "Thank you so much for teaching me to search more deeply within myself." "I did not get nearly enough of your, yet I have gratitude for having crossed your path. You are a gift to me and all of us. Thank you for sharing yourself." "Thank you for the fabulous session this morning and for your lovely presence on this planet Earth at this time. You are a beautiful soul." "Teachers like you are what makes this world keep going and honestly striving for a better planet. Thank you for sharing your wisdom with me." "Mahalo for a great exercise yesterday. It really impacted our tension in a positive manner." "We thank God for your treasured friendship and the blessing you've been to us and the thousands of lives you've touched." "I can't begin to tell you how much we enjoyed taking your yoga class on the beach. Your technique was very unique to us, extremely moving, calming, and spiritual and it gave us a peaceful feeling throughout our trip. I will share this experience with my yoga instructors and can't wait for the Full Body Elixir DVD and booklet to arrive. Thanks so much for sharing yourself and your yoga practice with us. We will remember you always." "ALOHA How are you I`m Kaeko We are Japanese mom and sisters. Thank you for your YOGA`s lesson on the beach. This photo was precious memory for us please take care of yourselves." Calley O'Neill, a visionary artist, has been practicing yoga daily for 33 years and teaches a fusion of yoga, qigong, self acupressure massage, mind/body integration and presence in the now. Called THE FULL BODY ELIXIR, it is a therapeutic, fluid and rejuvenating experience to dissolve the stresses in the nervous system. Guests return year after year for this Hawaiian-style "vacation within a vacation" recommended for those in pain and those with overburdened minds. In their excellent review of Calley's DVD, Yoga Journal magazine describes it as a "free-flowing practice that's open to the myriad movement possibilities of the human body and spirit." I cannot even begin to tell you how much you helped to transform me Calley. I have not been doing well for the passed few months and have been trying to figure out what is going on with me as I've been depressed and feeling isolated and unable. Hawaii was a blessing in so many ways. I've started some medication and seeing a doc but the medicine hasn't really helped me as of yet. Your yoga classes truly centered me and I am going to pull out my DVD so I can continue to hear your voice in my head and do your healing yoga. You are a gift to me. Thank you. My family LOVED our art class with you and Mark really wanted me to call you on Saturday to see if we could do another class with you! But I told him I should have contacted you about that before the day of since it was the weekend and your kids are off of school...so we had a "chill" day at the pool and the beachside instead : ) Don't be surprised if you get a postcard or two from us! You were the amazing, beautiful, energizing, creative energy that each one of us needed and soaked right in to our deepest cores. I just can't thank you enough. I will forward your yoga info on to friends, and I hope that you get a great response. We need you out there! I can't wait to show Sophia, Jack and Mark your artwork with Rama the elephant...do you have it up on a website? I'll google Calley and see what comes up! Love and more love to you my dear, wonderful, talented teacher. You are a mentor and a source of love and light. I am so thankful for you! Thank you so much for the information. 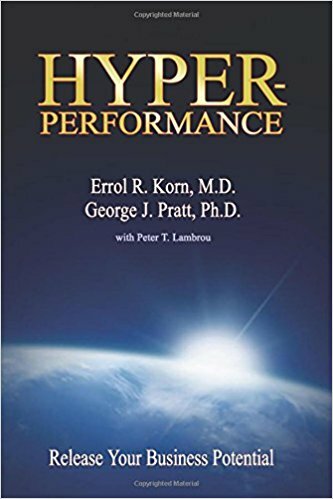 I WILL take a look at the book you recommend. I must say – my back pain is better. And I continue to do your video. Maybe not everyday but I love it. I just did it yesterday and feel so much serenity seeing the ocean at Kona etc. I WILL see you again soon in Hawaii. You're work is wonderful!!! I wanted to thank-you once again for being the main reason for my stay here an incredibly peaceful, spiritual, revitalizing week!!! I am practicing my yoga every morning with you. Lost your card and your e-mail. You really made an impression on me, so hope we can stay in touch. Calley, and I thank you for the privilege I had in doing so! I wasn't able to join my husband in Hawaii at the usual time in January so we are planning a trip May 22-29. I wanted to check if you would be teaching yoga at the hotel during that time because that is one of the key reasons that we stay there! There is not a single day that we do not think of you! It was such a pleasure to make your acquaintance. I always feel that we meet people in our lives for a reason, and we certainly have found so many blessings to meeting you! I have been doing my Calley DVD yoga nearly every day. Tom joins me when he can. Thank you for making that DVD-it is so nice to feel like we are right back on the beach with you! Calley, we’re home safely and had a wonderful Hawaiian experience. The Honu 70.3 race was a bonus to the whole vacation. I wanted to thank you for the two sessions we had prior to race day. The stretching was great, but more importantly the sessions relieved the anxiety and really put me in a state of mind to deal with a race on a course as difficult and challenging as Honu. I finished the course in 6:29+ a respectable time that gave me a top ten age group finish. If you’re not strong enough to race on Thursday, working out isn’t going to help. I would recommend to anyone the value of a couple of Yoga sessions prior to race day to give your body and mind the focus it needs to get out there in the proper state of mind. If I get back to the Big Island I will definitely be looking you up. "What a lovely, kind, compassionate spirit you are! I'm so glad I can take you back to Toronto with me." "Thank you for your enlightenment this week. It really added something special to my stay here." I’m sure you know you've had an immense impact on me, but I want you to know even though I don't get to see you regularly that the reverberation continues constantly. I've been trying to think of a name for the business I'm planning to start and had been absolutely racking my brain to come up with something. I finally fell upon one that appeals to me from the bottom of my core and after choosing it realized that it comes back to a conversation you and I had on the beach after a meditation session. Calley O’Neill (artist/yoga/spa/salon). We got to know Calley this year, somehow having managed to miss overlapping paths for the many years we have all been at the same place at the same time. All five of us in our party were smitten by Calley and her talents, but more by her as a person. There was an instant connection between Calley and each of those in our party, three adults and two children. We all enjoyed conversations with her as she taught or improved our yoga and art abilities, and helped each of us to grow as people, touched and inspired by her insights, optimism and her pure delight in sharing life, all it is, and all it can be. 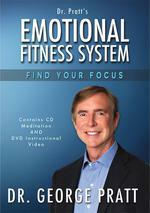 feedback: Hi Calley, Love your Instar guided meditations cd. It is a ray of sunlight in my -20 degree life in Edmonton, Alberta. Hope you are well. I think of you and our marvelous classes at with you often. Happy Valentine's Day! We hope you are doing well and had a great time in Toronto. 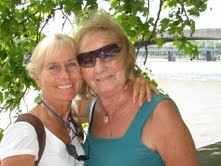 We really loved the morning yoga with you ot the beach, and I've also been doing your DVD. So nice to have met you and hopefully our paths will cross again soon. When I met with my wonderful healer he was specific about me needing to add the Full body Elixir to my daily routine for optimum health. Not that he knew about you but what he was saying I heard as bringing Calley daily into my life. So please bring to me your healing power as soon as you can. It has been more than a month since I saw the doctor and I am not able to see him again until I have followed his teaching from the last session. Your class is such a gift and it is such a pleasure to see how many lives you touch with it. I just wanted to let you know how much I thoroughly enjoyed your seaside yoga class last week at the hotel. I really enjoy yoga and didn't have high expectations of how good it would be at a "resort". Much to my pleasant surprise, it was great...and so much more than "yoga on the beach". I have thought about many things you said many times since last Thursday. Thank you! Took two classes from you about three years ago when I stayed at the Hotel. They were not really yoga classes, but like a class on how to deal with your stress. At that time I told you I was the chief of police of a city in southern California (still chief). I arrive in Hilo tomorrow where I have rented a house for four days then on Wednesday (Aug. 10th) I will be in Hawaii for another four days. Your class did a lot to help me de-stress last time and I was wondering if you still hold those yoga and meditation courses? Thanks for your time and I hope you are still doing this wonderful therapy. Calley, I cant remember If I thanked you for your nutrition sheet. Thank you so much! "Of course we found you! Our time with you is the highlight of our trip - we wouldn't miss it for anything!" What a lucky thing for me to run into you – literally - on beach! I’m so grateful that you made the drive all the way down from Waimea. Our Saturday sunset class was the perfect way to end my trip to Hawaii. I’d love to be one of your regular students and look forward to my next opportunity to practice with you. Now that things are returning to ‘normal’ around here, I can’t wait to begin incorporating the things you taught me. It was really a pleasure to meet you Calley. You have a wonderful energy! Many thanks! "I cannot thank you enough for your guidance and journey yesterday. After our session, I went scuba diving and had the BEST experience ever! It was all because you showed me how to reach, touch and love that inner child that I have neglected. I can now breathe freely and deeply and accept that there are many things that I will never find rational answers to...but that's OK!" "Of particular mention is your Yoga Coordinator, Calley, and her Yoga program. She is the biggest asset to your hotel. She distinguishes your hotel as the best hotel we have ever stayed at, and we have stayed at many. It is her exceptional knowledge of the art of well-being, her caring delivery, and the special interest she took in each and every one of the guests. I hope you know how special Calley is to your resort,. She is a major reason we returned this recent time and we will be looking to ensure she is a part of our next stay in the near future." I want to thank you for the three wonderful yoga classes that I was able to experience with you while I was in Hawaii during the week of January 20, 2014. I've not taken any yoga before and found your classes to be exactly what I needed. While I have been active and limber in my life, things change, things get stuck, and I needed a gentle way to ease away pain and to open up pathways both physically and mentally. The mere act of taking a class was a step in a shift that I wanted to create for myself. It was a way of honoring myself. You moved us through your blend of practices fluidly, gently and positively. I am so appreciative of your experience and nature. Thank you. Since my trip I made decisions that were huge for me. I stopped teaching and dancing (I will do some dancing), as there became more scheduling conflicts and pressure. I love dancing and teaching people to dance and, in essence, to feel good about something they're doing and about themselves, but it was time to move forward in other directions. I read about your yoga retreat at Breitenbush and would like more information about it, including the cost of course. I hope you are having a fabulous day today. Thank you again. 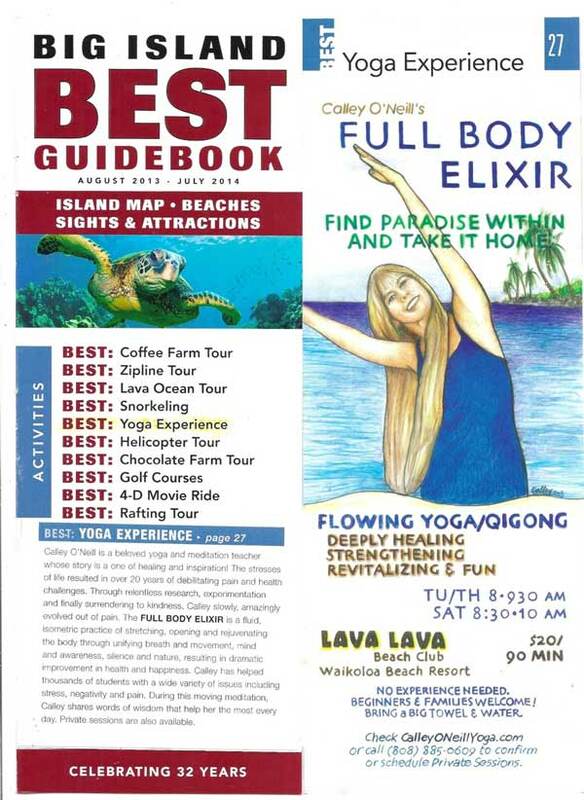 When the editors of Big Island BEST Guidebook did their research, they found YOUR testimonials, so many in fact, that we were selected, hands down, as the Best Yoga Experience on the Big Island! Your comments, encouragement, and stories are always welcome, and we really appreciate your sharing them with us as well as your friends and family who are looking for yoga on the beach in Hawai'i. This was the best yoga class I have ever taken. I wish I had taken more of these classes instead of being at the conference. I would have gotten so much more out of both. Thank you so much. That was wonderful. That was so much more than the yoga classes I take at home. I’m going to bring my husband on Thursday. In a conversation yesterday your name and DVD was mentioned and praised. This gal was visiting a friend while on a recent vacation and watched just a part of your video her friend said has made a great difference in her life. I have looked at your website and see the DVD available for purchase but wonder if you have sample clips I could view before I made the investment.
. . . it's never fixed in place. Instead, O'Neill--who expertly models her own work--is in constant movement throughout the several sections, rhythmically swinging and swaying every part of her body. Her work reminds me of the idea, popular among some yoga instructors, that the original asanas weren't formalized structures, nor were they imposed on the body, as they mostly are nowadays. Rather (the theory goes), early yoga practitioners expressed their asanas fluidly and nonrepetitively, very much like a dance, as their bodies responded spontaneously to mysterious inner urges of the moving spirit. As a yoga teacher, I found the description of your style so in harmony with the experience I try to give participants in my classes. I have looked at your website and see the DVD available for purchase but wonder if you have sample clips I could view before I made the investment. I hope knowing you and your teaching has come in discussion over coffee will make you smile! I’ve done a lot of different kinds of yoga, but I’ve never done anything like that before! That felt wonderful! We will be back on Thursday. As soon as I heard you chant, I knew this is what I came for! Thank you so much. This was the best yoga class I ever took. So much information and knowledge. I wanted to let you know how much I appreciated the moving yoga classes that I was able to attend with my brother in late March. I loved your location on the sandy beach under the shade of big beautiful trees. 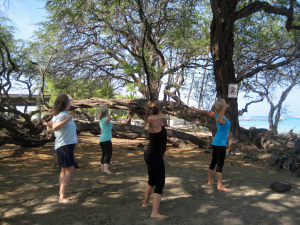 Your Full Body Elixir classes helped me to re-establish connection with myself and recognize the power of the Island. 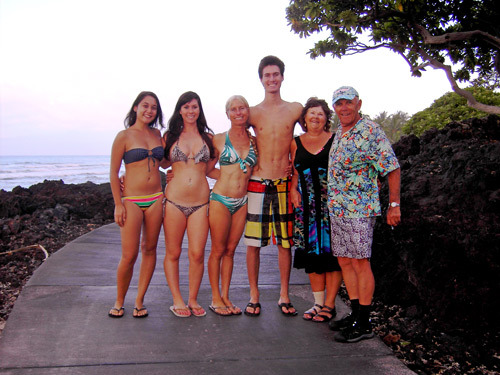 The Big Island is such a powerful healing island and you have an amazing ability to recognize the island’s power. Your positive affirmations and recognition of the power around us created awareness where I could make some very powerful connections inside myself. Vacation is a good time for me to focus on myself because I don’t have the regular demands and stresses that occupy my thoughts and emotions. You created an opportunity and situation for me to be able to regroup and appreciate everything and everyone around me. Thank you for sharing your amazing gift. Calley! It was SUCH a pleasure seeing you! Even after just one session I feel so much better...my body and mind feel so much lighter!! Your energy is beautiful and I feel so blessed to know you :-) Thank you so much! We're home and integrating back into mainland activities. I didn't realize how blissed out I was in paradise! I feel so grateful to have met you and can call you a new friend! I intend to stay in touch and follow your work. You're doing a great job just being the light that you are. Calley is one of my favorite people on the planet. Her youthful beauty and vital energy are testimony to the benefits of her unique yoga practice, The Full Body Elixir. The practice is appropriate for any yoga practitioner – absolute beginner to advanced. 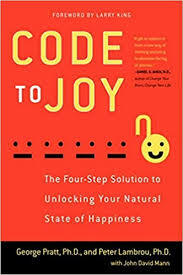 Besides the physical aspect of the practice, Calley brings generous spirituality, deep wisdom, and practical information about health and wellness. I especially wanted to thank you, Calley, for showing me a new way to enhance deep body healing and aura clearing through the Qi Gong practice. While we often think of yoga as competitive exercise, (or at least our western minds fall into the trap and expectation), the Qi Gong style was an absolutely wonderful way to become gently attuned to our body's breath and flow. This is ESSENTIAL for the first step of healing. Unlike our more athletic yoga, where positions enhance the energy flow through specific areas (also a needed practice), the Qi Gong got the flow moving during the reset. Again, I want to thank you for your heartfelt aloha and dedication. You are so wonderful! Spending our waking moments with you are terrific way to begin each day! We want to use your DVD to start our days in NYC this week and see if we can make time to stretch our minds and bodies! Of course, we need to MAKE the time no matter what for our exercise, but an hour is a lot!!! Wow are you talented! My husband and I just walked through the Hilton. I stopped and looked at your painting there, thinking what a wonderful artist. I didn't know it was yours! Got back to the hotel and got on your website before writing the review...There it was! I will begin the Elixir yoga DVD practice today! Finding Calley O Neill was a wonderful gift. What a beautiful experience which made my stay on the Big Island so special. I loved every minute of her presence, her teaching and her wisdom. I will take this memory back to Zimbabwe with me. Thanks for the great teaching while I've been in Hawaii. I really enjoyed the classes. Thank you for the teachings. This is Melanie M.. I attended your class while on the Big Island at Christmas. I am a physical therapist, and I would like to know more about the magnesium spray that you used. I have a patient that I think would really benefit from the spray to help with foot cramps. I so enjoyed your class. Someday, I would like to teach classes on the beach in Hawaii. You are an inspiration, and I love your spirit. Have a blessed day. You are a true joy! Thank you for your kind instructions and healing presence. The pain and tension in my shoulders and neck is completely gone. I don’t know where it went, but it’s gone!!! I had a stroke last year and this practice has helped me so much. 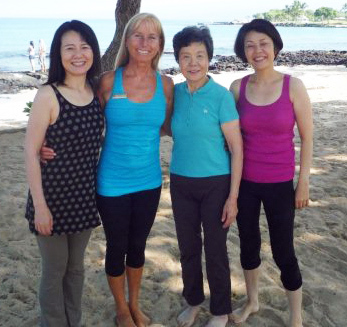 Here on the Big Island for five weeks, I have been coming to the classes on the beach regularly. I am regaining my balance, and feeling so much better, and its all because of this practice. I want to thank you again for sharing your practice with me this past week...I have had an amazing stay so far, and your yoga classes have been one of the highlights (along with the Kilauea caldera, hike over lava fields, and swim in the Green Sand Beach!). I cannot wait to return! I will pass word along about the Full Body Elixir and Lucid Dreaming Retreat, too bad I cannot make it this year, but please do keep in touch! Have a wonderful rest of the weekend, and I am grateful to have met you. I received the dvd's on Friday and they are my treat for this week. I completed my first 7 days of an arduous workout regimen and nutritional routine last week and am off my main medication...down 5.2lbs and very happy. I did 45 minutes of what I could remember of what you taught me one day last week (without the DVD) and I listened to my wonderful music I purchased years ago from Volcano Nat'l Park to help me focus. I'm dedicated and working so hard to regain what I lost and find my way back. Thank you and many blessings...please don't lose touch. What a cool experience today at yoga. Thank you. I'd not taken a class before and maybe this is common, but felt an amazing connection with you. Thank you. I will get minerals ... and I will practice. It has already made a difference in awareness and presence today. So....I love Hawaii, I love yoga, I love the outdoors, but most of all I love the OCEAN. The waves, the peace, the calm, the happiness....I have been to the beautiful Hawaiian islands some 30+ times in my 33 years, but I don't think I ever even began to fully appreciate the power and beauty of the Big Island until a few days ago, when I had my first class with Calley. This is truly the best yoga in Hawaii, though one can claim that any yoga class by the sea would be a dream. OK, maybe. So it was Calley then. Her presence, her spirit, her words, her knowledge of all kinds of wonderful people I should read.....wow, Full Body Elixir is an understatement. If you want to find peace, find appreciation of the moment of now, or hope to change your life in the future, start with a class at the serene Lava Lava Beach Club with Calley, I promise, you will be awestruck. 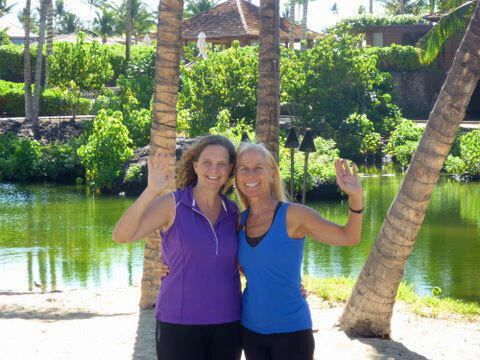 Calley O’Neill, originator of THE FULL BODY ELIXIR, has been teaching this practice as a part of my annual POWER OF ENERGY WORKSHOPS at the Fairmont Orchid on the Big Island of Hawai’i. Calley was introduced to me in 2004 by a mutual student, who said, “You two are teaching the same work from two completely different perspectives. You must meet!” The next summer, Calley was opening the days in the right spirit and energy to clear the way for my teaching in energy psychology and transformation. Vonda and I receive enthusiastically positive comments about Calley’s spirit, energy, infectious positivity, and the powerful positive effects they receive from practicing THE FULL BODY ELIXIR. With her skillful loving teaching, and knowledge of the Hawaiian culture and values, Calley has become a beloved and respected part of my Hawai’i. Island workshops!